Medium seems to be in trouble. 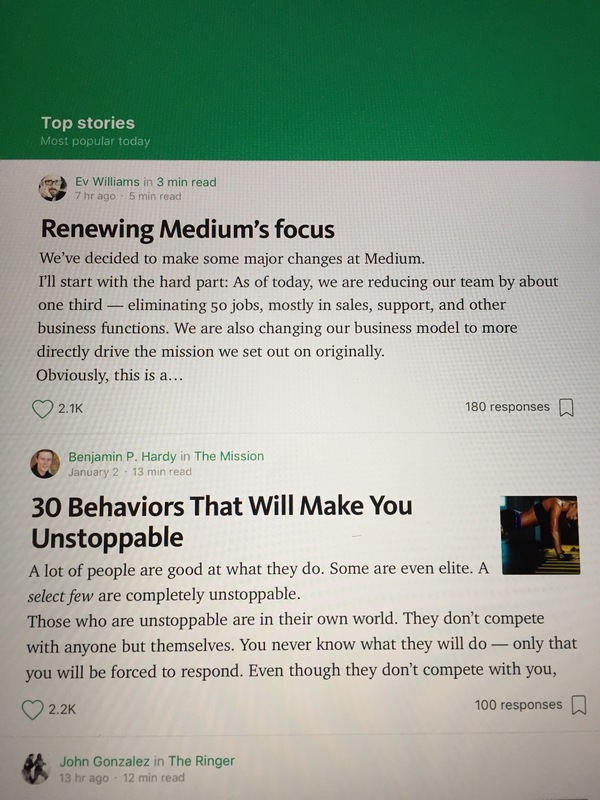 Medium seems to be in trouble and I’m not sure how to feel about it. Spending the past year torn between moving my site there and getting a little stomach acid in the back of my throat everytime I clicked on a link that took me to a Medium post, Medium’s demise would actually improve my quality of life in immediate and tangible ways. It sounds like they haven’t found a revenue model that works. And while I think highly of their principled stance against click-bate and the click-through dumbing down of the web, I’m also not looking forward to all of the dead links. As an idealist that is behind on sleep, I’d like to think that Medium’s demise would Or only be good for me, but also for the open web. If their claims about the number of words written on the site are accurate, and then the authors of those words move to WordPress or Squarespace, it could spur a new renaissance of independent blowhards, gurus, and bloggers. Imagine a world where people venture forth from the safety of platforms and feel the cool breeze of the open internet flowing through their greasy blogger hair! Of course, it probably just means Facebook gets more #content.